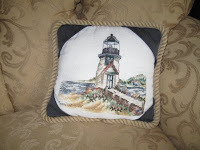 Here are a couple pillow examples. 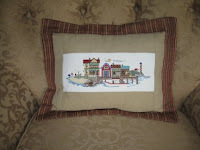 These are both cross-stitch made into pillows. Lighthouse is welted edge. Village is flanged. 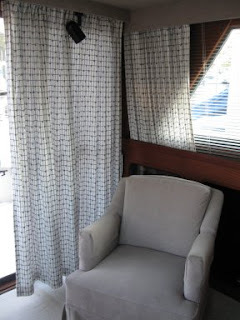 Drapery panels; Perry house; Living Room; 3 fabrics; lined; puddle length. 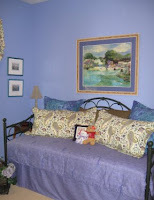 Balloon Valance; Perry house guest room. 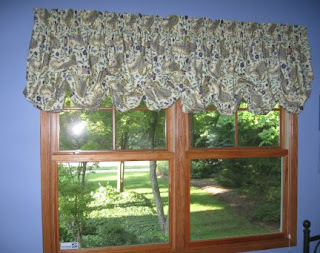 The fullness of this valance is what makes it so beautiful -- 2-1/2 times the window width is recommended. 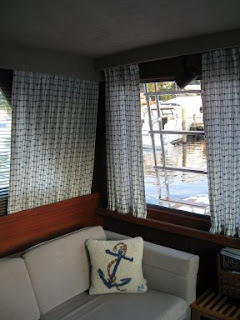 Here are a couple boat interior window treatments in the salon aboard Gonzo. I solved my first serger problem! I've made a lot of progress. I mastered completely rethreading the serger. Helpful hint -- when you are first learning to use your serger, thread it with the color threads of the loopers and needles. It REALLY helps understand what's going on. I also played around with converting from 4-thread, 2-needle to 3-thread, 1-needle. It's when I tried to go back to 2-needle I ran in to a snag. My upper looper (green) was not catching my left needle (red) thread. My left needle thread was not engaged in the serging process at all. This drove me crazy for 2 days. I tried adjusting tensions, seam widths, etc. with no luck. The only thing I had done to convert to 1-needle was to remove the left needle, so maybe the needle was not in right. When I watched in slow motion I could see that the upper looper was not catching the left needle thread. Eventually I realized that if I pushed the needle forward a bit, it caught the looper. I then referred back to the picture in the book. Sure enough, in the picture, plain as day, it shows the left needle is shorter than the right which meant I didn't have the left needle pushed up all the way. Once I adjusted it -- perfect! I'll post a picture. Maybe I'll save someone else some misery. Here it is! The first official Anchors A-weigh tablecloth which will be sold exclusively through Floatinteriors.com, eventually! 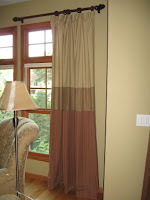 It is made of indoor/outdoor fabric and has a weighted seam (non-lead). So, as you can see, the flag is blowing but the tablecloth is not. I've joined the American Sewing Guild hoping to find others that I will be able to talk to about sewing. I'm also hoping there is a serger support group! Well, I got braver this weekend and completely rethreaded the serger in the colors that correlate to the loopers and needles so I know which isn't doing what's it's supposed to be doing. I did something wrong because my left needle thread isn't participating at all with the others! I have a sample I plan to take to Field's tomorrow and see if someone can help. I did finally finish my tablecloth! If I can figure out how to post a picture, you too will get to see it. Hello and thanks to all who have been asking how I'm getting on with my serger. After experimenting with tension settings for several days I decided to move on to blind hemming. Some of you know I'm working on a tablecloth project -- Anchors A-weigh. For those of you who don't, I'll catch you up later. I set up the machine by the book and proceeded to blind hem a few scraps. The first one wasn't great, but by the second, I was feeling pretty good. So I decided it was time to move on to my tablecloth which is 52" round. Entering a seam proved to be a bit of a challenge. When sewing on a regular sewing machine, you lift the presser foot, slide the fabric under, lower and go. The problem with that same approach on a serger is that you have the cutting blade in the way so you really have to be sure you are positioning your material properly, which I did not -- which resulted in the blade coming down where it shouldn't have and putting a hole in my tablecloth -- it's now a 50" round. On my second try, I started off correctly. However, after I sewed around the entire tablecloth and took it out to inspect I found that I had unfortunately only connected with the fold 1/3 of the time. Now I have to rip the seam out. This is very important -- you DO NOT want to have to rip out serged seams. It takes forever and trashes your fabric -- it's now a 48" round. Now frustrated, I am thinking I might do this the easy way which would be for me to serge the raw edge and then sew (on my regular sewing machine) a top stitched hem. But the serger in me says I need to master doing this all in one operation. So for now I'm walking away from this project for fear that if I kept making mistakes I'd end up with something resembling a table doily rather than a tablecloth. You must have a serger! A number of people told me that in order to pursue professional level sewing I must purchase a serger. Now, I did mention previously that my sewing machine is from 1975 didn't I? So part of this process is discovering developments in sewing over the last 3+ decades. Well I did a lot of online research and pricing, I spoke to people who had sergers, etc. Although it is tempting to shop on line, I strongly recommend the route I took. Field's Fabrics sells Baby Lock products which were highly recommended to me and my online research backed this up. The half hour I spent at Field's speaking to one of their experts was invaluable. 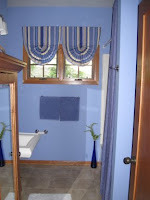 I was also pleasantly surprised by their prices which were very competitive with some of those I found online. But the biggest advantage for me are the classes and the availability of experts should I ever need help. Online is great but there is still nothing that beats a live person! I purchased a Baby Lock Lauren Serger. It's the 'entry level' but I learned I can trade up within a year and not lose any of my initial investment (another advantage to shopping locally). I'm enrolled in the new owners class as well as the Serger Notebook class they offer, both of which are later this fall. I honestly can't imagine receiving this machine in the mail and knowing the first thing to do with it. It's quite the contraption and it looks pretty intimidating. Truth be told, thanks to Wendy at Field's I now know what the heck thread cones are and why I need them! I brought it home, watched the DVD and can't imagine how I ever managed without one of these. I've started to figure out a few things and can't wait to take the classes! I already know the smartest move I made was buying from a local sewing center. Stay tuned for my adventures in serging. My Aunt Virg taught me to sew long ago. 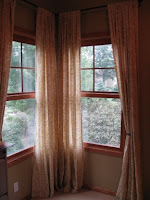 Her basement was full of fabrics all the time and there were always projects laying about. After high school I went to college in a fashion design program taking tailoring and textile courses. So what happened, where did I swerve off this path? Remember marabou? The fru fru stuff that edged dresses and capes back in the 70s. Yep, that's what did it. I made my mother a blue knit dress with a chiffon cape trimmed in marabou fur. The dress turned out fine and mom looked beautiful, but I decided at that point that clothing was just not my passion -- not to make anyway. So I changed degree programs, to Finance no less, and moved on. 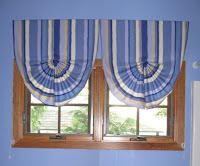 But I always continued to make window treatments, bedding, upholster items, etc. -- and I enjoyed it. But I was self-taught and never learned the professional tricks of the trade, which is what I propose to do now. So to Aunt Virg, who I spent countless hours in the basement with digging through fabrics and trims -- and to my mom who bought me a sewing machine in 1975 which I continue to use -- She Sews!